So You've Decided to Watch Agents of S.H.I.E.L.D. If you're looking to jump in to Agents of S.H.I.E.L.D., there's a lot of in-universe mythology to catch up on. Its first season was disappointing. Discouraging! Season 2 is better. Like, a lot better. Encouraging! Season 2 is better largely because it's gone much heavier on mythology and serialized storytelling, which means it's tough to penetrate if you haven't watched the rest of it -- including the supposedly-lackluster first season. Discouraging again! Indeed. But fret not! With Agents taking a week off before its mid-season winter break (which actually isn't, but we'll come to that) and thus column-space in need of filling this week, I've gone ahead and drafted this quick, conversational catch-up guide -- which should (hopefully) prove helpful to anyone who wants to dip into the series' recent installments without having to commit to watching everything that came before. Enjoy! Alright. First question: What is S.H.I.E.L.D.? First question-answered-with-a-question-for-reference: Have you seen the Marvel Movies? Yes! Well, some of them. Most of them. I think? Some, at least. Okay. Did you see The Avengers? Dude, everyone's seen The Avengers. I'm pretty sure there are undiscovered tribes deep in the Amazon rainforest who've never seen a White man face to face... but they've seen The Avengers. Good. So, that jacked-up sci-fi version of the CIA/NSA Samuel L. Jackson was running in The Avengers? That's S.H.I.E.L.D. Oh! So it's a show about a huge army of badass 007 types with flying aircraft-carriers who hang out with superheroes? Not exactly. Agents of S.H.I.E.L.D. 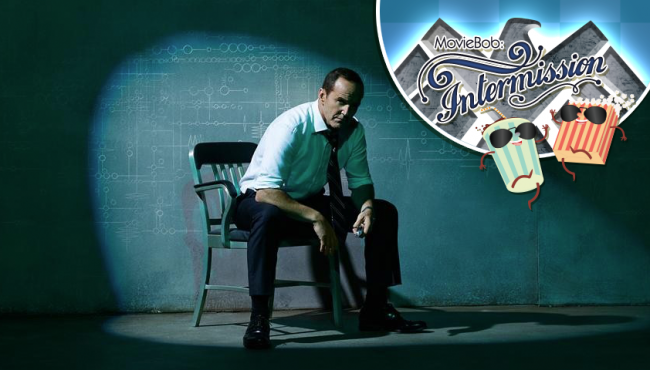 focuses on the adventures of a small team of specialists from the Agency, led by Agent Phil Coulson. He was the Agent in The Avengers who was a huge Captain America fanboy. Clark Gregg played him. Yup. That's part of the main story in season 1. As far as Coulson knows, he was only "dead" for a brief few moments before doctors pulled him back from the brink, but quick-thinking Nick Fury (Samuel L. Jackson) lied to The Avengers and told them he had died so that they'd have something to rally behind re: taking the fight to Loki. For going along with this, Coulson has been given a high-tech private jet ("The Bus") and his own team to run as a covert mini-Agency running down X-Files-type phenomena. But there's a problem. Over the course of season 1, Coulson discovers that he actually full-on died, stayed that way for days and then got Frankenstein'd back to life by S.H.I.E.L.D. super-science -- specifically, a serum derived from the (apparently) ancient corpse of a blue-skinned alien. Said serum made most exposed to it crazy, so his memory got wiped. He unwiped it, then in season 2 cures himself of crazy by figuring out that the serum-induced visions are leading him to some sort of ancient lost city. But that's getting ahead of ourselves.